I was too young to read the Lord of the Rings trilogy by then so I chose to read its prequel intended for younger readers. 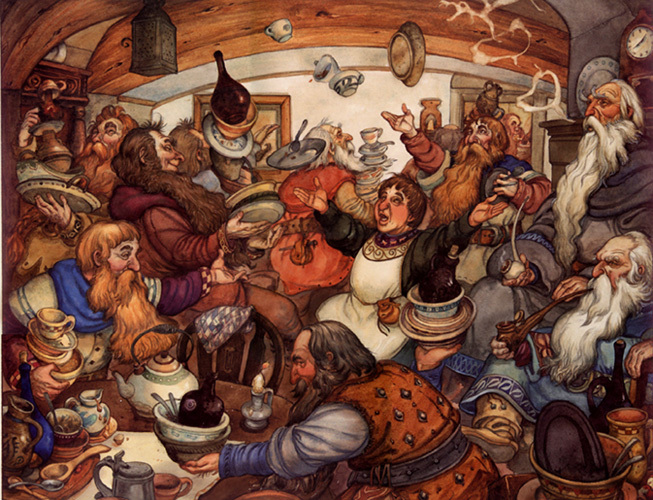 The excitement was double this time for many people said that this book is the most successful of all Tolkien titles. My appetite for fantasy novels were so great that I never hesitated buying the book. 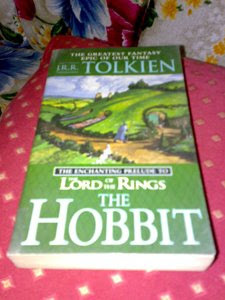 Bilbo Baggins', the main character and home-buddy titular Hobbit, at-first-hesitant adventure brought to me new visions. The read was so simple that even a child could understand it. I was greatly amused of its quirky characters especially the dwarves and Bilbo himself. Every chapter presents varying adventures which will wisk away your boredom. The story begun when Gandalf, the wizard, wittingly tricked Bilbo into joining a band of Dwarves to claim the treasure guarded by the dragon, Smaug. Upon their travel they fall into great perils and had some interaction with ravenous trolls and war-like Orcs. And by accepting the disreputable, romantic, fey and adventurous side of his nature (the "Tookish" side) and applying his wits and common sense, Bilbo develops a new level of maturity, competence and wisdom. "Clap! Snap! the black crack! What's more enjoyable are the poems, or songs rather, that are sprinkled along in the story. The merry nature of the verses adds to the thrills and excitement as the characters delve even deeper into their adventure. The conclusion was so satisfying that the fierce battle and the additional conflict marked into my mind. This story is the mother of all fantasy novels that sprouted today and I can't deny the fact that most of it's elements are being copied from time to time. Nothing beats the original, so they. It's so good that the producers of the Lord of the Rings decided to adapt it to movie as well. After seeing the original trilogy on the wide screen, I can be rest assured that this adaptation will earn same respect and acclaim in the future.